For the majority of triathlons, you’ll be swimming in open water. This is typically a source of anxiety and fear for many athletes as training for the open water is often limited. While not perfect, it is possible to do some of your preparations for race day in a pool! Here are some drills and skills that you can do in the pool to be prepared. The first, and perhaps most obvious, thing you can do in the pool is to practice sighting. In a short course pool (25 yards or meters) pick your head up twice each lap and sight on something at the end of the pool. In a long course pool, sight at least five times per lap. What’s most important here is that you don’t just go through the motions. Be sure you actually focus on what it is that you’re looking for. I call this precision sighting. First practice the basics of sighting, then dial in and focus on smaller objects in the pool area to sight on. Can you actually read the pool clock when you sight? How often should you sight? Well, that depends on how straight you swim. When you’re in the pool, going fast is what gets you to the next wall more quickly. In open water, speed is not enough. It’s your velocity plus your trajectory that determine how quickly you get into T1. In a lane by yourself, push off the wall and swim with your eyes closed. How far can you make it before you run into the lane line or wall? (Make sure you know your stroke count so you can open your eyes before you get to the wall if you happen to make it all the way down the lane!) If not, how far can you go? If you start in the middle of the lane and drift to one side by the other end, that’s not too bad, but you’re still off course about a meter over a length of 25 meters. If you’re consistent, that would work out to about 20 meters off course every 500 and then double that because you’ll have to swim back onto the course. So that might cost you 30 to 60 seconds every 500 meters. But what if you hit the lane line after only a few strokes? You might be costing yourself several minutes over 500 meters. The solution is sighting. If you can swim four strokes before veering off course, you should be sighting every four strokes. If you stay on course through 10 strokes, sight every 10. Now put these two elements together. Swim with your eyes closed but open your eyes to sight every 4, 6, 10 strokes. Can you make it down the lane in a straight line? You’re onto something important! Sighting may take a little extra energy, but it’ll keep you in a straight line—that makes for a faster swim split. Practicing sighting makes it more effortless on race day. For many swimmers, wetsuits feel constricting. This is necessary for them to provide warmth and buoyancy and to minimize drag forces, but it can be unfamiliar and even uncomfortable until you get used to it. Every few weeks, include a wetsuit set. It’s best to start your workout in the wetsuit (because they’re pretty hard to put on when you’re wet) and do a longer, continuous swim of 500 or 1,000 yards. Bonus points if you hit it hard from the start without much (or even any) warm up. This way you can kill two birds with one stone—wetsuit practice plus getting more comfortable with the breathless discomfort that often happens at the start of a race. Once you finish your wetsuit set, jump out, and do a run/wetsuit strip to make sure you can get out of it quickly and efficiently. Swim some sets where you turn just before the walls—don’t push off the walls. You’ll lose all momentum and then have to build it up again each lap. This is also the perfect practice for races with deep water starts. Invite two or three other swimmers into your lane and sprint out some hard 25’s with everyone lined up side by side. Rotate through positions. If you’re on an end, you’ll want to breathe to the outsides. While I’m not a fan of the traditional bilateral (every three strokes only) pattern, you need to be able to breathe to either side in order to get air in traffic. What about when you’re in the middle? That’s a tough spot so you’ll need to figure out how to make a little space in order to breathe. 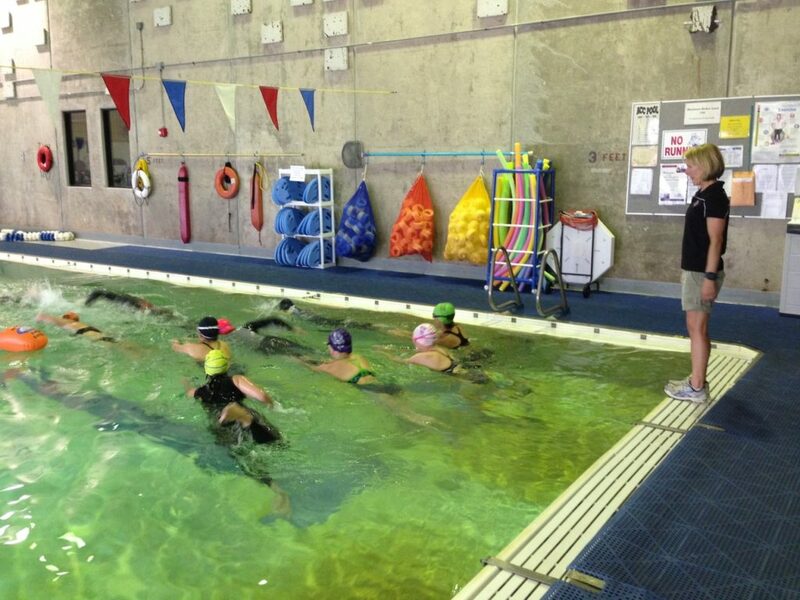 There’s nothing like practicing in the more controlled pool environment to develop and hone your skills and strategy. While none of these drills are a perfect substitute for open water, practicing in the pool will go a long way toward being ready for race day! One last thought—don’t wait until the week before the race to incorporate these ideas into your workouts. These ideas should be a part of your regular training through the offseason and as you get closer to your race.